For Halloween this year ...Red dressed as an Annoying Aspergers Christian preaching the gospel to all those who don't want to hear -over and over and over again. I am continually annoyed by his preaching especially, since most of the time he has no idea what he's talking about, his facts are not straight. He has a tendency to listen to the interpretation of others, which is often based on opinion. Since he is so black and white -he believes almost anything that comes out of the mouth of another Christian. At the same time, I am so happy that he has his faith. If you've followed this blog for a while, you may know that I was raised as a Jehovah's Witness. Yes -one of those annoying people who knocks on your door on Saturday mornings when you're trying to relax and watch cartoons. Believe me, I wanted to be home watching cartoons too, but my mother chose otherwise. We attended some kind of service or bible study 3 times a week, and then Field Service on Saturdays. HATED IT! I didn't protest too loudly. It wouldn't have made much of a difference anyway. But as I grew into my teenage years, I became more and more crafty at ways to get out of it. I also became pretty damned good at finding ways to do things that I wanted to do ...like dating and hanging out with my "wordly" friends. By the time I hit 17 ...I was officially done. I was tired of the judgment of the congregation and the all-life-invasiveness of the religion. I told my mom, I am totally done with caring about what these "people" think about me and what I'm doing in my personal life. DONE! I remained a faithful Christian who for many years carried tons of guilt for everything that I did. Of course, the guilt didn't stop me from doing what I really wanted to do. My Christian upbringing was however, a good guide between right and wrong. It lead me to stay away from drugs, and smoking (unless you count marijuana). Drinking? That's another story. I was always a natural servant to others following the example of Christ. 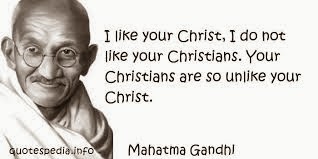 In fact, Christ is still my favorite Christian. I didn't allow my faith to stop me from having any fun as it did all of those years that I was controlled by my mother and the religion with no Christmases, Halloween or birthdays. Yes people! This is the reason I still treat my birthday like a national holiday and I celebrate for a month! I'm scarred! As an adult and a parent, I provided Christian guidance and values for my children, but never strongly pushed church. It was always so hard to get the boys together enough to go when they were younger, but we did go periodically. After leaving California and moving to Texas, I never quite found a church home in which I was totally comfortable. As a middle-aged adult, my ministry is helping other families through this blog and the support groups that I run. Writing is my gift from God that I share with the world and I do so in service to him. I don't need the approval of anyone besides God in my ministry. My relationship with him is private. A few years ago, Red found his way to church with a friend. It's a very small, relatively quiet church where he found love and acceptance. He became close friends with the Pastor of the church. In fact, he and his wife pick him up every Sunday morning. He is a part of Red's team of mentors; a friend he can call when he is having a rough time. He's a friend who I can call if Red is having a particularly rough day and needs someone ...when he is not listening to me. After all -I am his mother, which means I'm clueless. I am eternally grateful to his pastor and friend, for what he has done and continues to do for my son. As a matter of fact, he is taking Red to his first Christian all-day concert this Saturday -Spirit Fest. Red is so excited! Christian rock has become his favorite genre. He actually put down Linkin Park, and some of the Heavy Metal music and has replaced it with praise music, which he LOVES to sing all.the.time! Much to Blue's annoyance. I call him the Annoying Aspergers Christian because his faith, the gospel, and church have become his latest obsession/fixation. He preaches to all of us in this house without ceasing. He also tries preaching at school. And quite frankly, he doesn't always have his facts straight. I know the bible! I have studied the bible backwards and forwards most of my life. He's been a Christian for 15 minutes and he thinks he can school me ...and my 74 year-old mother. He is constantly talking about who is and is not going to hell; who is not Christian enough; who must be an Atheist because they don't go to church every Sunday, or 3 times a week like he does. Isn't it ironic that he chooses to go to church 3 times a week and I never pushed him? If I had pushed ...would he be as sick of church and judgmental Christians as I am? He goes to not one church but two different churches. He attends his home church on Sundays. On Monday and Wednesday nights he attends another church because he loves their youth program. Yes. My heavily religious childhood has left certain scars. However, my faith in God remains in tact. I am so thankful to him that he has touched Red's heart. This has been the only thing that has truly turned his life around -for the positive. The boy who used to post curse filled rants on Facebook is now quoting scripture and leaving positive messages about God's love. The boy who hates to read is now reading the bible -on his own. He uses a computer application that helps interpret the bible to help him understand it. Yes ...he talks about his faith all day long and to everyone who is willing to listen.